How much time could you save if you didn't have to worry about creating a server-side to store your data while working on a web or mobile app? Thinking on that, I launched a service called OpenWS which is a platform to help mainly frontend developers to easily store any JSON object in the cloud without any server-side knowledge. OpenWS provides a REST API to create, update, delete and retrieve JSON data, so it is completely straight forward to integrate OpenWS with all the major web frameworks like AngularJS. Before using it, you need to create an account in OpenWS. After that, we'll provide you an API KEY which is necessary to be passed in with the requests. Below is an example of how you can save a product JSON object into a collection called products using jQuery's $.post. // Saving in a collection called "products"
Firebase is a good platform for storing JSON data. One downside though is having to use their SDK to save/update/retrieve/delete data instead of using REST standard. It means integrating it with AngularJS or BackboneJS for example is not completely transparent. OpenWS on the other hand provides REST API, it means you can use POST, PUT, GET and DELETE methods and also have the standard URL resource-naming convention, making it easy to integrate any webapplication with OpenWS. 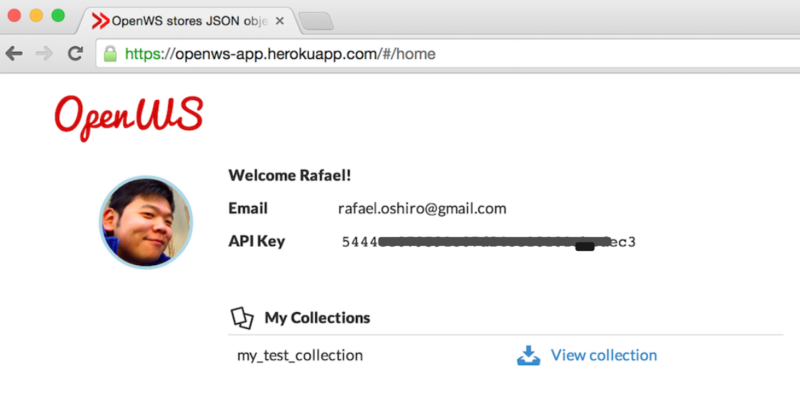 OpenWS webservice is built on NodeJS and Express running on heroku hosting. All the data is persisted in MongoDB which makes it easy to work with schema-free JSON objects. And for the landing page/web application, I used Angular JS. OpenWS can be used with any platform. It works great with AngularJS, EmberJS and BackboneJS. Also it's a great fit for Mobile developers. If you're a frontend developer and have a side-project that needs to persist some JSON data, give OpenWS a try and you will check for yourself how much time you will save and how easy it is to use it.